So he set off on the great job search of 2015. Obviously it wasn’t that dramatic, but it felt that way in our house. Every time he interviewed with a church I would immediately start looking at rental houses, school statistics, and other places in the area where I could find work. And then one day he got a job offer. In a place where we NEVER expected to go. You know how sometimes you see a job opening, and you decide, “oh what the heck, I’ll apply for it, I’ll probably never move to __________, but I’ll apply anyway”? Well he is now the Director of Student Ministries at a Methodist church in _____________. The name of the town isn’t important, because we all have those places, the places we think we’ll never go, because they aren’t the places we know. They aren’t comfortable, they don’t have the same people, the same customs, or sometimes even the same language. God has a funny way of calling people to places where they didn’t think they’d go. In Genesis 12:1 God tells Abram (eventually Abraham) “leave your country, your relatives, and your father’s family and go to the land I will show you”. According to the story, doesn’t say, “Hold on God, what are the real estate prices in this ‘land you will show me?'”. He goes. It isn’t always easy, he has to fight people, he pretends his wife is his sister twice so he won’t get killed by men who would have like to have her for their own wife. He has a son with another woman instead of trusting God that Sarah would have a son. But ultimately, God is faithful, and the promise God makes with Abraham is kept. God’s plan wasn’t contingent on Abraham’s perfection. Sometimes we get in the way of God’s plan for our lives, I’m sure my own planning gets in the way of God’s plan much of the time. 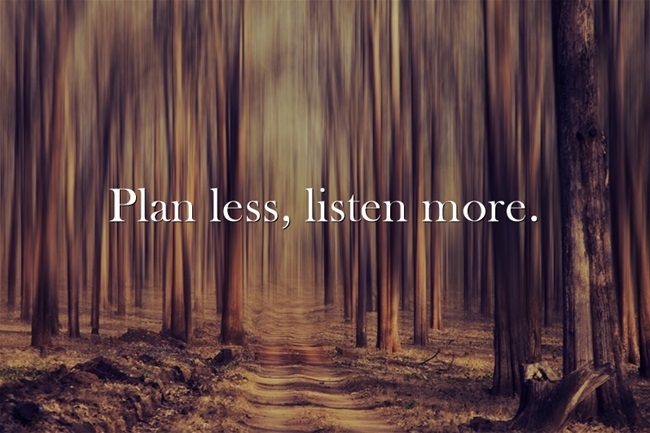 What if we planned a little less, and listened a little more? Maybe then we’ll be ready to leave our homes, our comforts, the security of our own plans, and go to the places God will show us.